Oh, yellow... Never a good choice for a shopping center. In England, they call malls "out-of-town centres" because they, of course, are typically just outside of town. Looks like Westfield is going to double the size of this one. And hey, did anyone know TJ Maxx in England is TK Maxx? What mall isn't owned by Westfield these days? With the people walking around in their winter gear in this one it amd the white floor it almost looked like a skating ring at first. If it opened in '72, how can that picture be from '71? Just when I thought our avacado greens and rust oranges in OUR malls were ugly in the 1970s. That yellow tops them all. It just sticks out like a sore thumb. I have an old 70s avacado coffee percolator that's exactly the same color as that facing! Actually, it's called "avacado mist" on the bottom label, but I just had to go dig that sucker out and hold it next to the screen--yep, they match perfectly!! Not sure if that's good or bad, lol. For some reason, this place reminds me of my highschool, built in 1976. They used the same freaky yellow. Seemed to be a similar matter in the US, where malls often were built outside of town in land that was once farmland, abandon airfields, etc. These days, those malls that are still around often aren't "out-of-town" given how the town eventually grew around them in later years. Being reminded of seeing pics of what Westfield Franklin Park had looked like in the 50's or 60's when it was an airport or such. Too bad they forgot to buy out Southwyck while they had the chance in Toledo. Now it's going to be torn up in favor of another outdoor commercial/residential property that's not going to be of any interest to me during the wintertime. My high school was the same way too. I am British and have never heard the term "Out-of-town-center". And, unlike the US, our malls are more commnly located in the very center of a city (downtown) rather than in the suburbs as you would see in the US. The exceptions are the more modern mega-malls that have sprung up since the late 80s, such as Meadowhall, Lakeside, Bluewater, The Trafford Center and so on. Broadmarsh is actually located right in the very center of Nottingham, and also houses the city's main bus station. Nottingham also has the Victoria Center, abouta mile to the north, still in the city center. 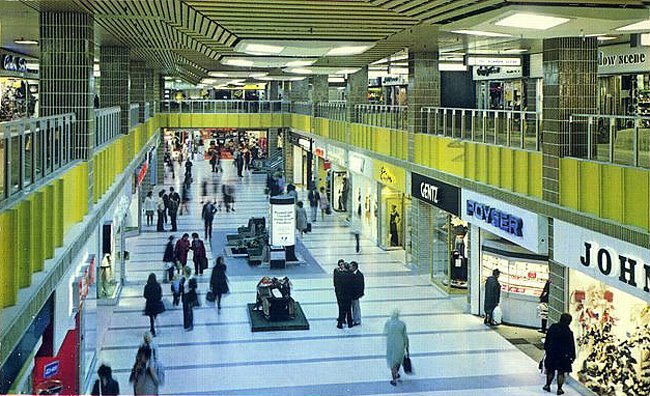 Broadmarsh has always been "The other mall" with lower-end retailers. The mall got worse and worse and was almost a dead mall in the early 1990's. Then a major refurb bought it to life and as you have noted, there are plans to enlarge it further and make it more of a lifestyle center. The TKMaxx store in the center used to be a Co-op Department store. That closed down in the early 90's and Alders, a rather upmarket store by Broadmarsh standards, took it's place. Alders went bust a couple of years after it opened in Nottingham and TKMaxx moved in. The reason that TJMaxx is called TK in the UK is that there was already a discount retailer in the UK called T J Hughes, Maxx renamed soas not to cause confusion when they entered the UK fairly recently. Now every town has one, normally in a city-center location rather than the bog box locations as you often find them in the US. Finally, Westfield actually own very few malls in the UK. Australia, the home of Westfield... EVERYTHING is owned by them, so it seems.